OK, so I'm lame and I won't be at the SXSW conference where apparently EVERYONE will be. But at least I can try to be there in spirit. 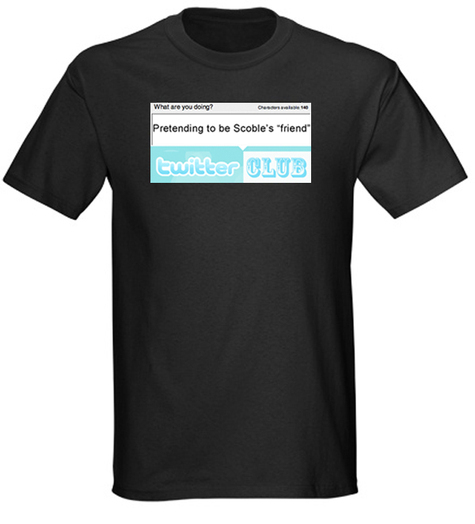 Robert Scoble is scrambling to try to get Twitter Club T-Shirts printed up, so here is a mock up (I made the visual extra big so you can read it on your screen). I have the source file (Photoshop). If you can think of a few short "Twitters" to go in the box—I'll make a batch and send them over to Mr. Scoble so he can hunt down a 24 hour printer (that is if he thinks the idea is worthy). Have fun!